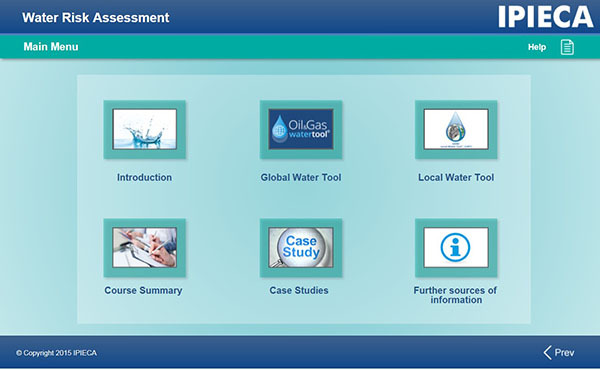 We are pleased to share that IPIECA has developed a new e-learning course offering training on water risk assessment tools, including the GEMI Local Water Tool for Oil & Gas. GEMI and IPIECA collaborated in the development of the GEMI Local Water Tool (LWT) for Oil & Gas, a customized tool which may be used together with IPIECA’s Global Water Tool for Oil & Gas. GEMI and IPIECA work together to promote the two tools as mutually compatible and a provider of best practices for sustainable water management at the global, regional, national and local levels. Please see the IPIECA news release below for more information on the new e-learning course. Having supported the development of the IPIECA Global Water Tool for Oil and Gas (a customised version of the WBCSD Global Water Tool) (GWT) and the GEMI® Local Water Tool for Oil and Gas™ (LWT), IPIECA is eager to ensure that members and the wider oil and gas industry are able to use these tools successfully. In order to maximize usage, we developed an online e-learning course. The Water risk assessment e-learning training course aims to improve uptake and implementation whilst helping companies effectively, efficiently and easily monitor, assess and manage water risks. Through various interactive and flexible units, the course provides managers with an overview of water risks in the oil and gas sector; and practitioners with a thorough overview of how to use and interpret outputs from both the GWT and LWT. IPIECA encourages the oil and gas industry to take advantage of this great resource, to learn how, at your own pace, to use these water risk assessment tools and make a difference to the communities you operate in. A completely flexible approach whereby users can work through at any pace and complete the units in any order. It is estimated that completing all the units would take approximately two hours. A voiceover accompaniment to complement the text and highlight key messages – this can be switched off using the mute button. Quiz questions at the end of each unit ensure your understanding – please be assured answers are not recorded or timed. Link to existing, in-house training. If you have any feedback, comments or questions about the course, please contact us – we would be happy to hear from you. IPIECA may update the course and release a version 2 in the future so we would welcome any constructive input. To use the new IPIECA Water risk assessment e-learning training course please click the button below. For a brief overview of the aims and content of the E-learning Course, please watch our new promotional video. If you wish to learn more about water risk assessment tools then IPIECA’s Review of water risk tools (2014) is available to read and download.